Food costs are one of the most important aspects of any profitable buffet. Reducing waste, using up inventory, and providing the right foods to satisfy different types of guests are all important. The bottom line, though, is operators need to use up as much food as possible in order for food costs to go down. Plan menus accordingly, and use as much food as possible. The arrangement of a buffet or serving line is all about the details. Maximizing the potential for profit is key to the format of the line, and there are some best practices for operators to consider. For example, place more expensive foods at the end of the line when there's less space on the plate. Put foods that might drip or spill at the front of the table instead of the back. And keep foods grouped together to make the line for efficient. The whole goal of the line is to make the experience easy for guests while increasing earnings for the operation. In order to serve a great menu using the right types of formats and arrangements, the equipment will often play a major role in determining what is possible and what isn't. Putting certain foods on pedestals is a good way to maximize the possibilities for food display areas, but you need the right type of table or stand. How tables are arranged will determine the flow of guests, so consider curves instead of keeping lines straight. And finally, different types of stations will provide operators with a range of capabilities to make all guests happy. 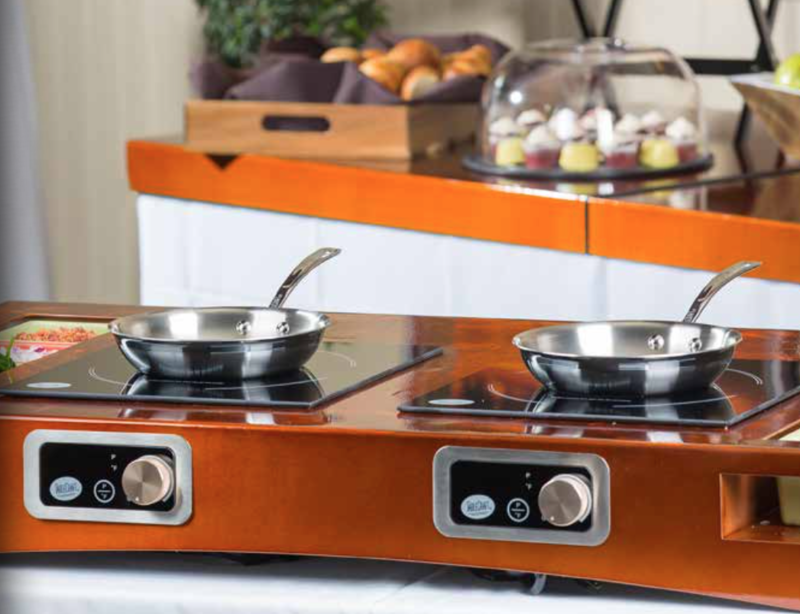 For example, a buffet line that utilizes Action Stations from Tablecraft will have options that range from cooling and chilling to induction cooking. These kits can fit right on countertops for ease-of-use, making Action Stations great for omelet stations, stir-fry counters, or other made-to-order menu options that might require both cooking and chilling capabilities. These often tend to be the most popular parts of the entire buffet or serving line.